【Perfect Experience】Foldable and lightweight. You can fold the projection screen and put it in a backpack or suitcase. 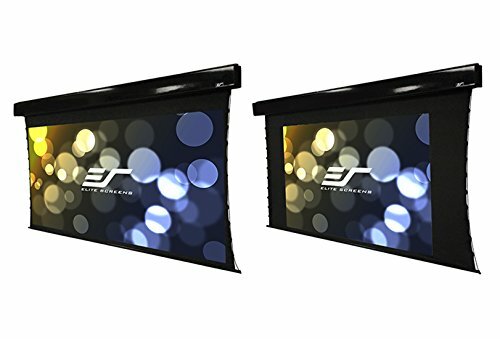 Front & rear projection screen - It is an ideal choice for portable indoor or outdoor theater, suitable for watching HD outdoor movies, classroom trainings, holidays and parties, conference room presentations, outdoor public displays and so on. 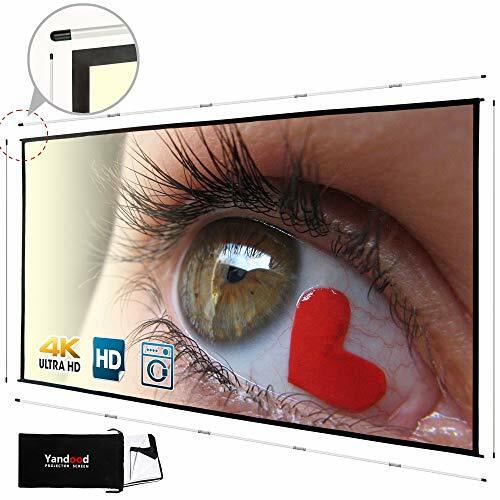 【Durable & Anti Creases】This portable projector screen made out of high quality polyester material has an extremely low reflectivity and high average projection display values, providing flicker-free projection. No obvious creases are left when the screen is compressed or folded, as it effectively prevents wrinkles. 【Fast 3 Minute Setup】 This 120 projector screen takes only 2 steps to quickly set up and begin the usage,no screws are necessary. 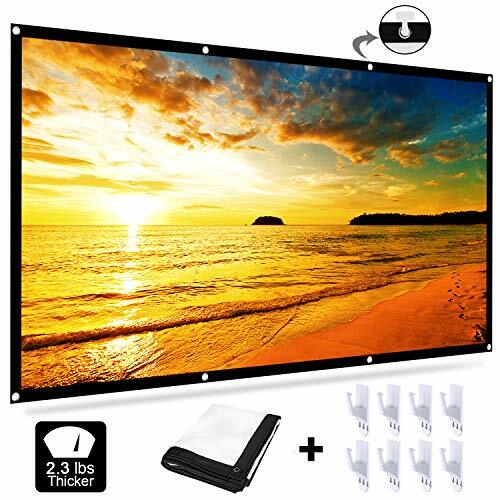 NOTE:The first step: open the package .Second step: attach this video projector screen easily with hooks, ropes, brackets, nails, double side tape on the wall/mount. 【Waterproof & Easy To Clean】Our projector screen With high quality and no deformation even in bad weather conditions. 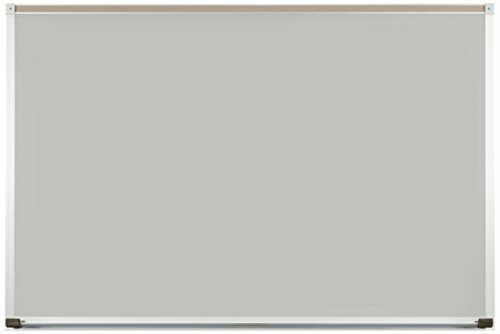 White surface.This New synthetic canvas has a mildew resistant coating which is easy to clean by mild soap or water.Please DON'T use abrasives as they will damage the screen. 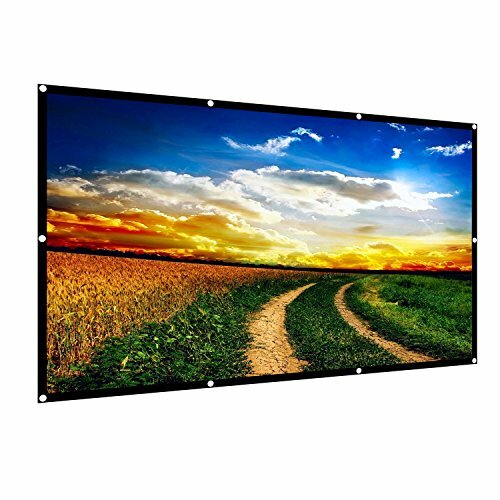 【Size and Warranty】16:9 tv projector screen format and diagonal 120" offer 104" x 58" viewing area. Please take into account that material size may vary by +/- 0.5" in length/width.If you have any questions about the product, you can contact us anytime. 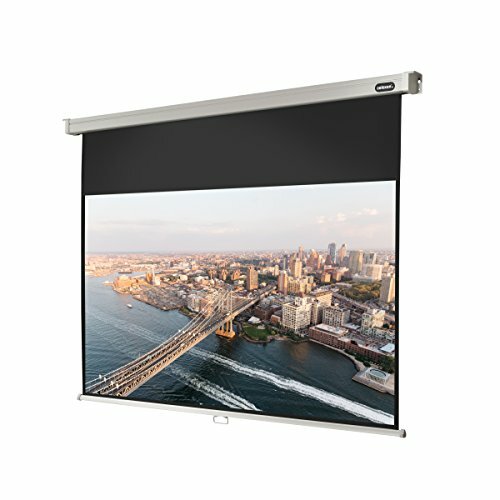 Portable and Wrinkle Free:The whole package of this screen are lightweight and easy to carry,lightweight and portable, you can fold it in small size and take it wherever you want!Made with wrinkle resistant polyester fabric; this white projector screen won't have any creases when it is compressed or folded. 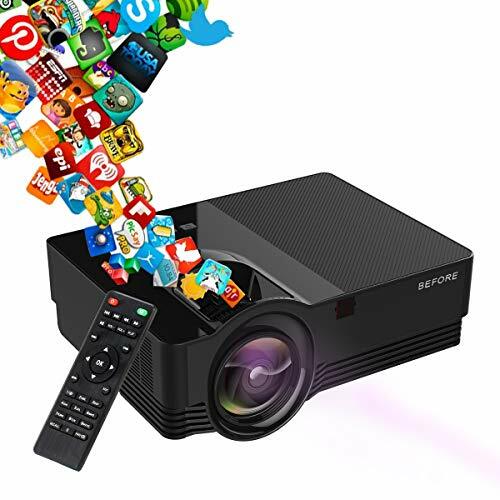 WORK On Most Situations :ideal for home theater movies, education, conference room presentations, public displays, outdoor movies, etc.Invite your families or your friends, sharing your joyful time with each other. 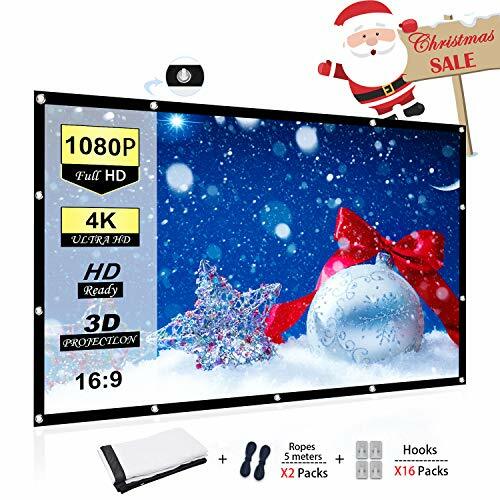 Widely Used:16: 9 comfortable screen format, diagonal 160" Area, in addition, it supports two-sided projection for the eyes to bring the best viewing feast.160° viewing angle, 16:9 screen format, diagonal 120", providing you 104" x 58" viewing area. 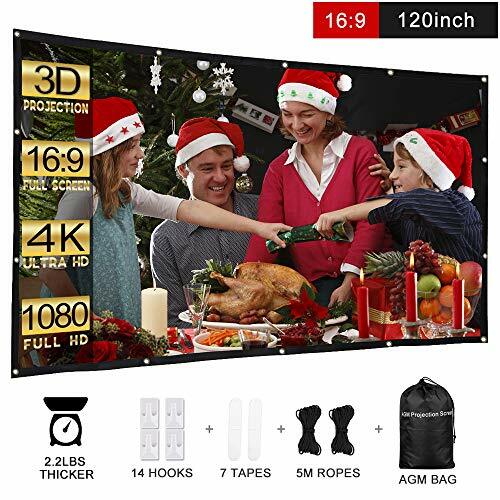 【Upgrade Thicker Version】: This is upgraded version different from other ordinary movie screen, more than 2 times thicker than other low-quality projection screen to avoid light penetration which allows for a clearer and more vibrant image. 【Anti-crease And High Absorbent Material】: The Projector Screen contains 8% more Spandex in the Polyester fabric material, which increases the elasticity and the silkiness of the Fabric, while effectively preventing fold lines and ensuring that no creases when folded / crushed. 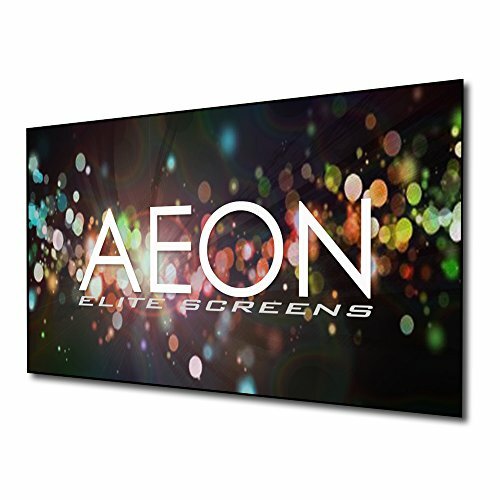 The projection is sharper and brighter than most other projection screens. 【Easy To Set Up】: The Projection Screen can be fastened easily with hooks, ropes, bracket, nails, double side tape on the wall/mount. The package contains 16 hooks and 2 bundles of cuttable ropes for use. 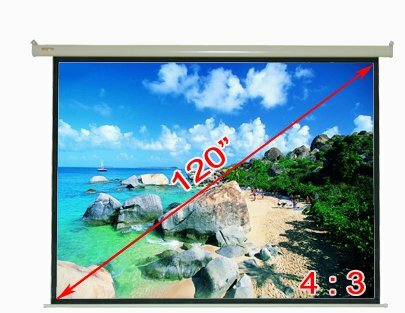 【Wide Viewing angle】: 16:9 screen format and diagonal 120" offer 104" x 58" and over the 160-degree viewing area, bringing you a fantastic widescreen experience. &#x1F497;【 Easily Clean Me If I Have Dust 】➤Wrinkle-free screen can be spot cleaned with mild soap or water,avoiding yellow staining to better watch your favorite films.Tips:please do NOT use abrasives, it will cut off the life of the screen.Your Ideal choice for home theater movie, education, conference room presentation, public display, outdoor movie and more. 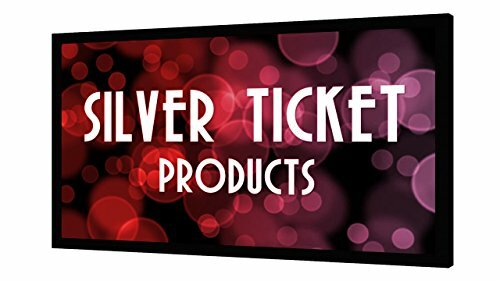 &#x1F44D;【 I Can Both Front & Rear Projection 】➤This simple movie screen is designed with suitable thickness for not only front projection at home, but also rear projection at outdoor activities. Why spend hundreds of dollars on Movie theme parks? 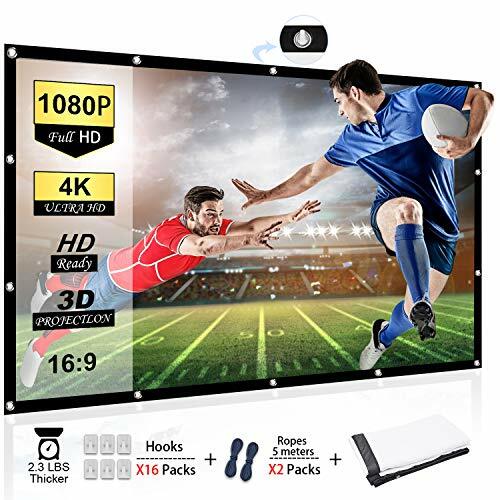 This projection screen can bring your favourite movie to your home but spend a little money.Just call up your friends, buy some popcorn,cool down some beers,begin your football/gaming night NOW ! 【Durable& Anti Creases】 Made of high quality polyester material and can effectively prevent wrinkle, no crease left When the screen is compressed or folded. 【Thick than Others】 Different from other ordinary movie screen, this is upgraded version,more than 2 times thicker than other low-quality projection screen to avoid light penetration for a clear image Screen. 【Portable for Traveling】it can be folded into a small bag (included), so you can take with you for outdoor use, camping, etc.This is a really good and light-weight screen. 【Supper Easy to Mount】The eye holes are a great feature making it easy to hang up. Nail, hooks, ropes or tapes, whatever you prefer. As long as you stretch the screen just a tiny bit you will get a perfectly flat surface to project on. 【Warranty & Application】Friendly customer service and fully refunded within 30 business days. 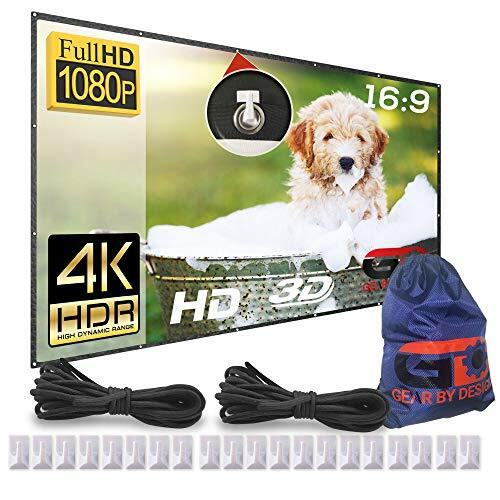 It is an ideal choice for portable home indoor or outdoor theater HD movies, classroom training, Party conference room presentations, outdoor public display. ❤100'', Made from translucent polyester material, it can be cast at front and rear for projection.The four black sides can enhance the image contrast. 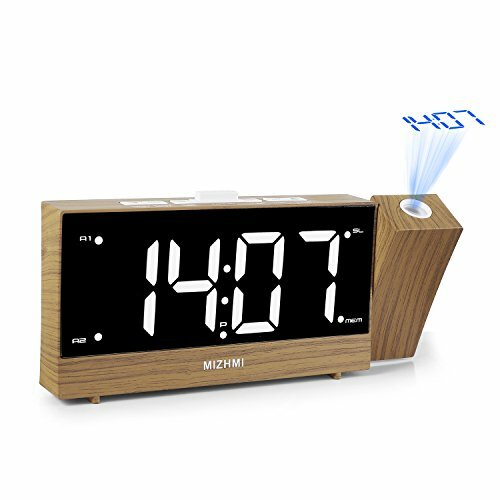 ❤It can be easily mounted on the wall or removed from the wall with the double-sided tape and hooks. 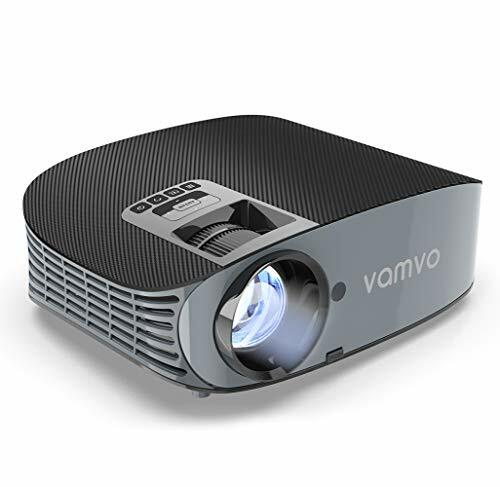 ❤It evenly diffuses projected light and you will experience the perfect visual enjoyment of the best images and color reproduction. 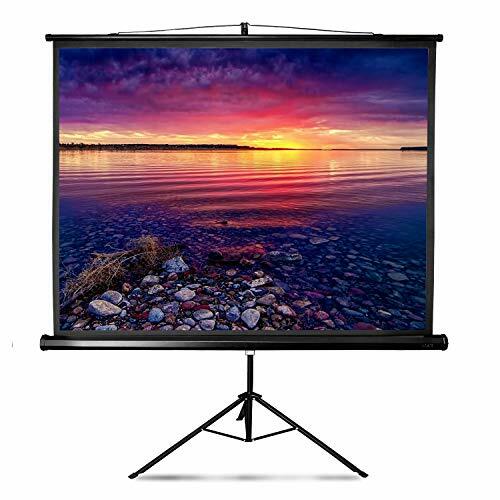 ❤It is suitable for a variety of occasions and is the top priority for outdoor open-air movies, home theater movies, classroom training, conference room presentation and public display. ❤It can be folded as small as possible and will not take up much space for easy portability. 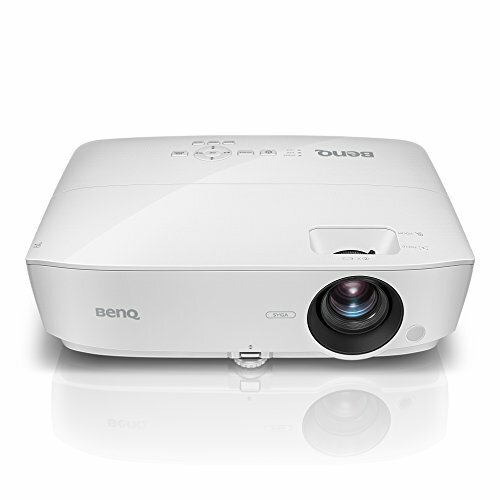 In addition, it is universally compatible with most LED, LCD or DLP projectors in the market. 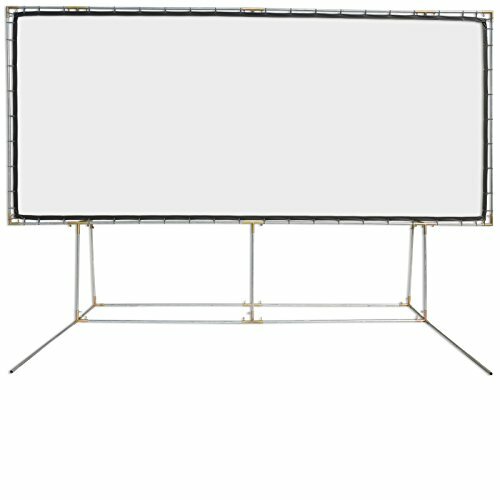 THICKER,HEAVY DUTY MATERIAL -Projector Screen high-definition outdoor is made from a thicker material which allows for a clearer and more vibrant image while avoiding the light penetration that you get with lower quality products. Our Projector Screen weighs in at about 2.2 Lbs versus other thinner screens that weigh in at 1.1 Lbs. 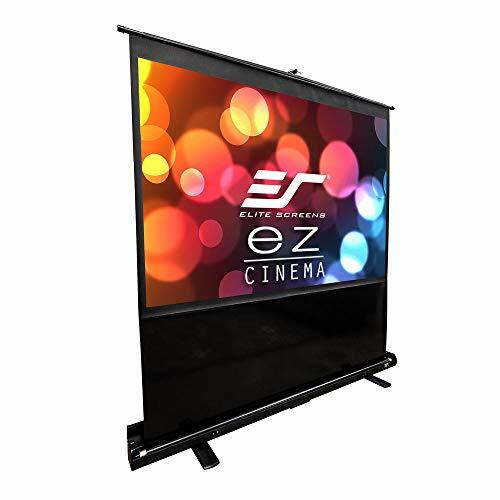 ANTI-CREASE AND NO WRINKLES - Efnik 7 Projection Screen Portable Projector Screen contains 8% more Spandex in the raw material, which increases the elasticity and the silkiness of the Fabric, making it foldable while effectively preventing fold lines and ensuring that no creases are created when the screen is compressed. 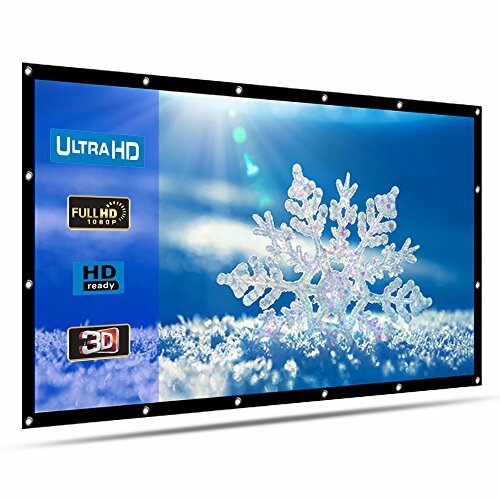 EASILY INSTALLED OR MOUNTED - Outdoor movie Screen can be quickly and easily installed in just a few minutes using ropes, hooks, brackets, nails, or double-sided tape. 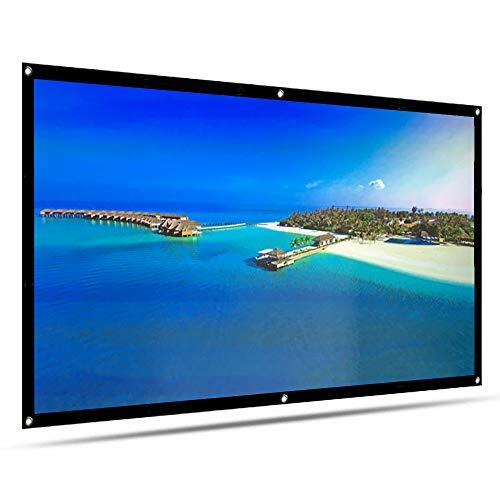 It can be mounted horizontally or vertically, and used as a front or rear-projection movie screen. There are 14 grommets on the reinforced border around the hd screen. Also included are peel-and-stick hooks and 2 bundles of ropes. 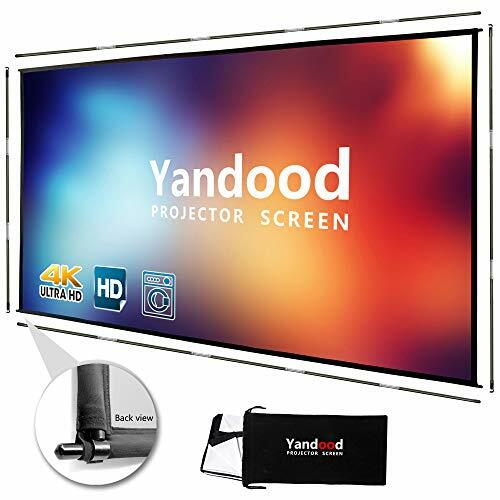 PORTABLE AND LIGHTWEIGHT - 120 inch projector screens is portable and can be folded small enough to fit into a backpack or suitcase, or you can choose to store it in the provided non-woven fabric bag. 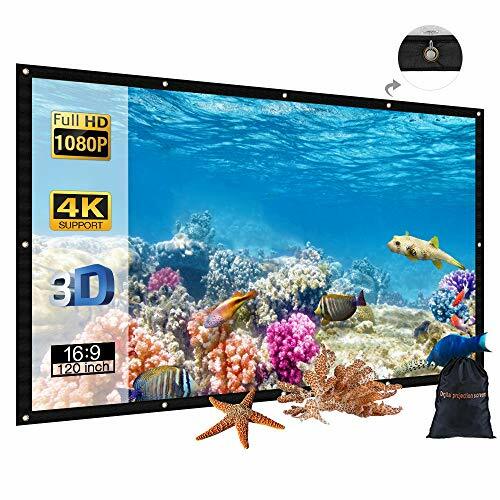 This rear projection screen is suitable for meetings, home theater, sport games, outdoor movies, etc.It is an ideal choice for most family.So just take it with your friends or kids wherever you want to go. It bring you a colorful life and give you more Surprise and happiness! 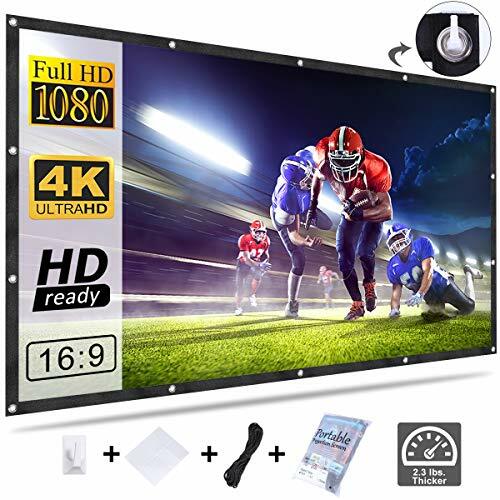 ⚽ Wide Application - Suitable for education, conference room presentation, public display, outdoor movie, ome theaters, businesses, and classrooms, etc. 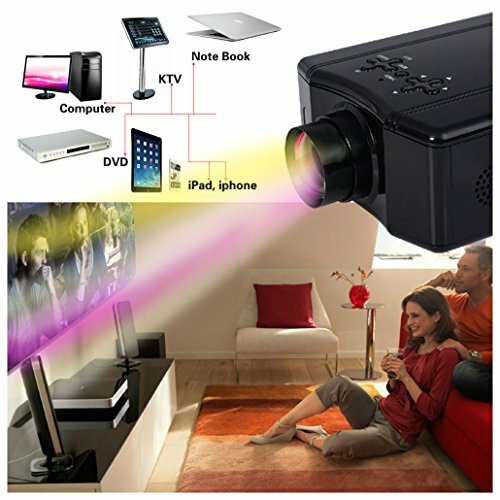 Best Portable and Foldable Projector Partner. 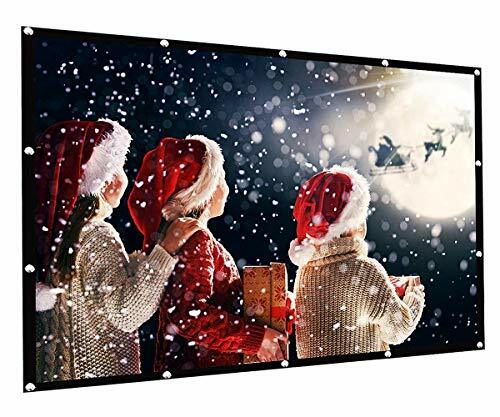 ⚾ Perfect Viewing Angle - 16:9 screen format, diagonal 100" offer 87" x 50" viewing area, offer you a clean, clear and pure white movie background. Clearer and less reflective screen with a wider viewing angle also features a black masking border for increased image focus and alignment. 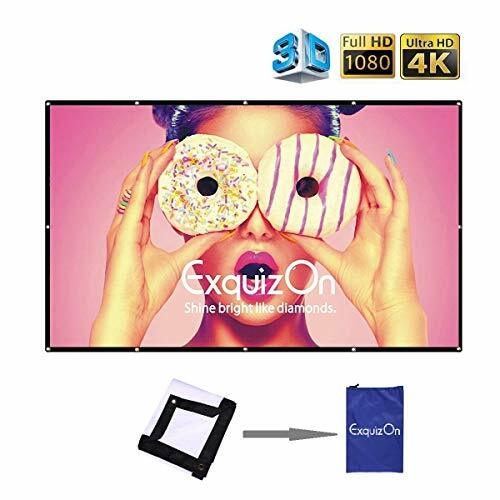 &#x1F3C1; Top quality Projector Screen - Made with natural Polyester fabric that the projection is sharper and brighter than most other projection screens, you don't need to worry about wrinkles or creases caused by screen folding. And is both stain and mildew resistant and made of flame retardant fabric, easily to clean with soap and water. 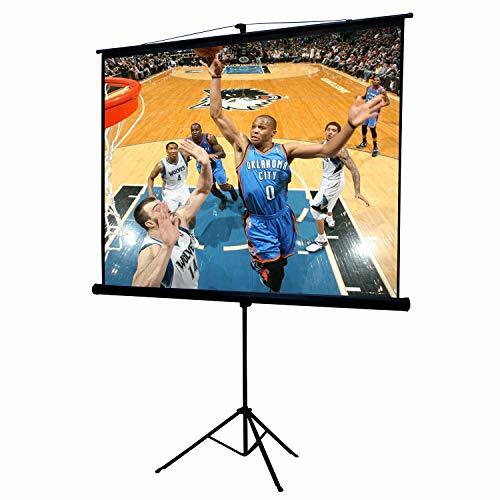 ⚾ Portable & Mobile Projection - Quick installation, lightweight and compact one-piece design. You can fold it in small size and take it to wherever in your backpack or suitcase. ⚽ Easy To Set Up - Stop wasting time leaving the screen hung for days or ironing it. Just hang it and turn on your projector. The Projection Screen can be fastened easily with hooks, ropes, bracket, nails, double side tape on the wall/mount. Designed for quick setup, making it perfect for travel. 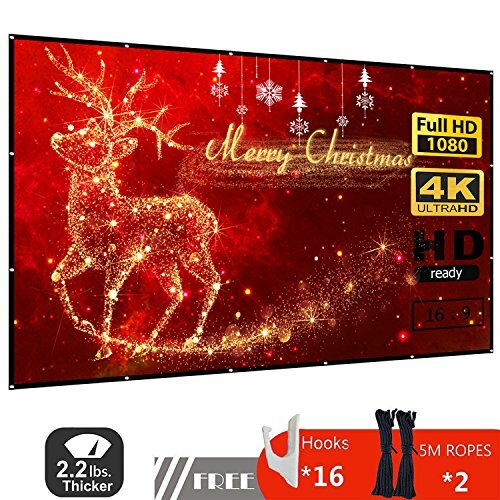 ★ HD projection screens, widely used -16: 9 comfortable screen format, diagonal 160" Area, in addition, it supports two-sided projection for the eyes to bring the best viewing feast. 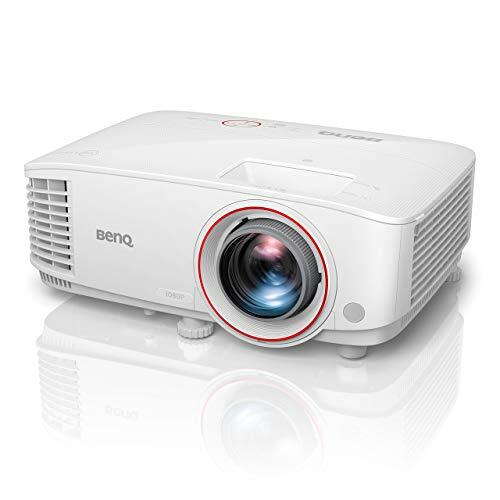 ★Widely used - ideal for home theater movies, education, conference room presentations, public displays, outdoor movies, etc. ★ No wrinkles, no creases - made of natural polyester fabric, folded or squeezed without wrinkles, making the projection Brighter, smoother and clearer. ★ easy to install and disassemble - the upper and lower ends are reserved for holes. The projection screen can be easily fixed to the wall/bracket by hooks, ropes, brackets, nails and double-sided tape. ★ foldable design for easy carrying and storage - you can fold the screen into small sizes and put it in backpack, suitcase, storage bag. Carry it around and wherever you go. 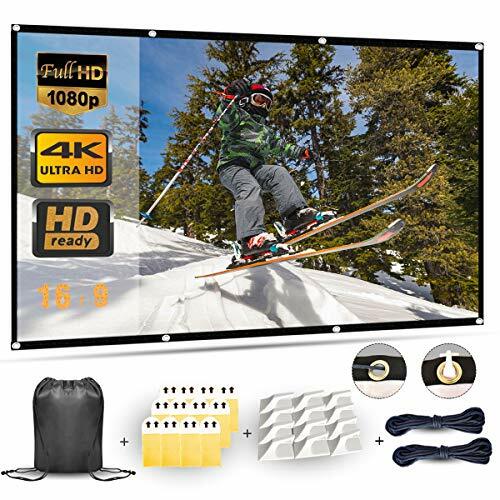 &#x1F525;【Ultra HD Experience】HOMEMAXS HD foldable protable projector screen is made from better projection materials than other projector screens, which is results in better resolution and clearer projection with your 4K/3D projector. 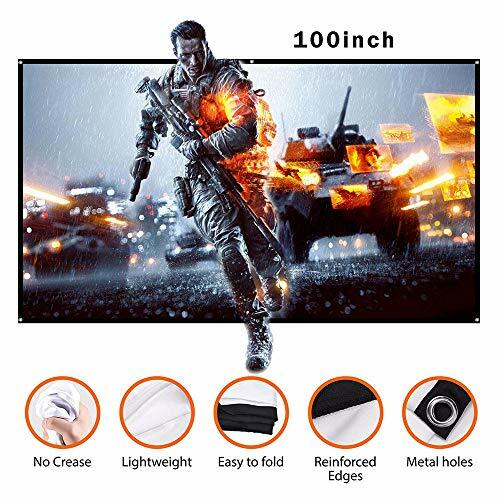 &#x1F525;【Anti-Crease & Foldable】Our movie projector screen is made of high quality polyester and spandex materials, which are both flexible and durable. There will be no creases or wrinkle on its smooth elastic surface. 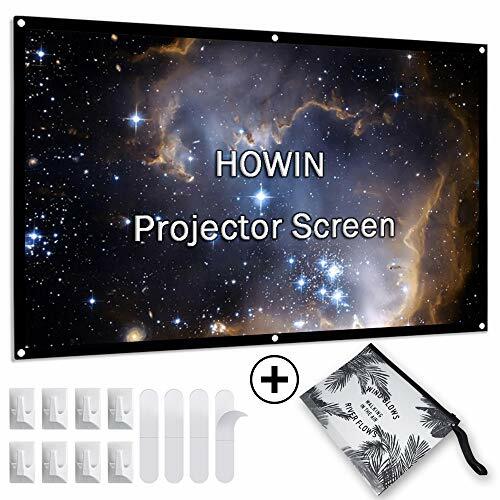 &#x1F525;【Double- Sided Projection】This front and rear projection portable projector screen will give you a real home theater. 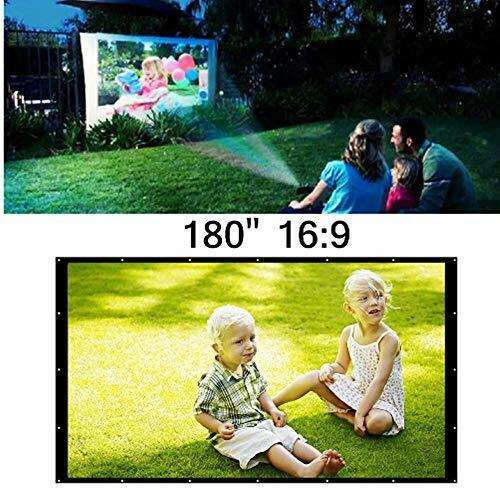 Waht's more, Homemaxs projector screen can be as an outdoor projector screen so that you can take it anywhere you go with its lightweight and folding design. 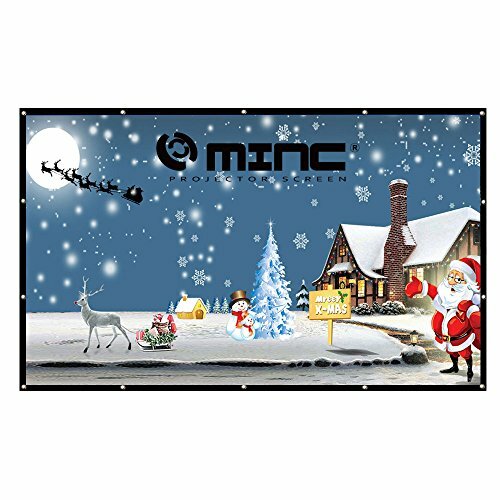 &#x1F525;【Wide Viewing Angle】Enjoy experience of a 120-inch 16:9 aspect ratio projector screen. It has anoptimized 160-degrees viewing angle, which means you'll always have the best seat in the house or outdoor. 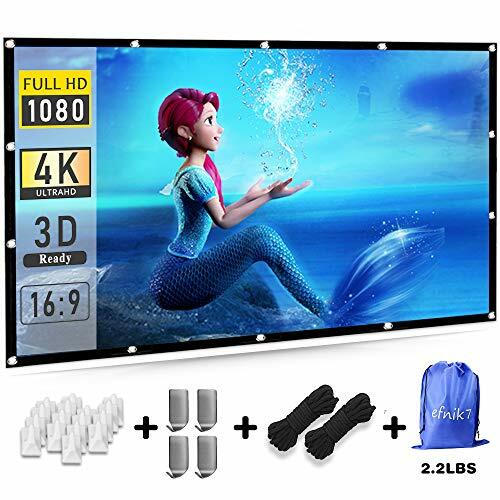 &#x1F525;【Risk-Free Purchase】HOMEMAXS projector screen is easy to install and use with wall hooks and ropes. If any reason you are not satisfied with this purchase, kindly contact us and we will give you a new replacement or full refund. 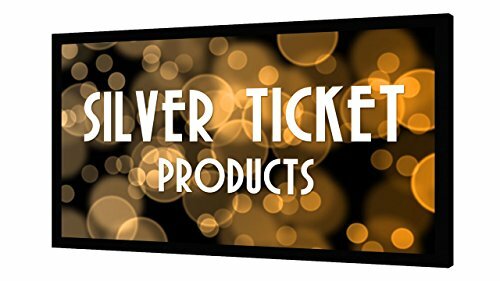 Don't Worry About Taking The Screen With You: Newly Designed Screen Is Easily Transportable And Convenient: All Of Our Foldable Projector Screens Are Laptop Sized And Easy To Travel With; They Are Compact And Lightweight; The Included Drawstring Bag Will Keep Your Portable Movie Screen Safe And Sound. 【FOLDABLE & ANTI-CREASE】Chalpr 120 inch projector screen can be folded or washed without creases, which is made with natural polyester fabric, so that our movie screen is brighter than most other projection screens, bring you the best watching experience. 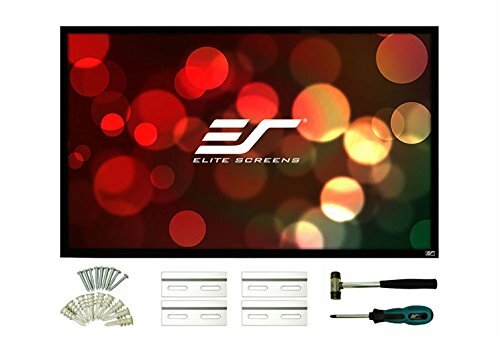 【SUPER EASY TO SET UP】The projection screen takes less than a few minutes to fully set up the entire assembly by using hooks, ropes on the wall or tree. Our projector screen comes with 16 hooks with stickers, 2 ropes (5 meters). 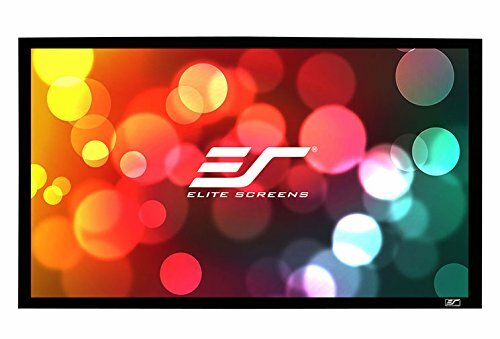 【PORTABLE AND LIGHTWEIGHT】Our movie screen is lights weight and portable, you can fold the screen in small size and put it in your backpack or suitcase to take it wherever you want. 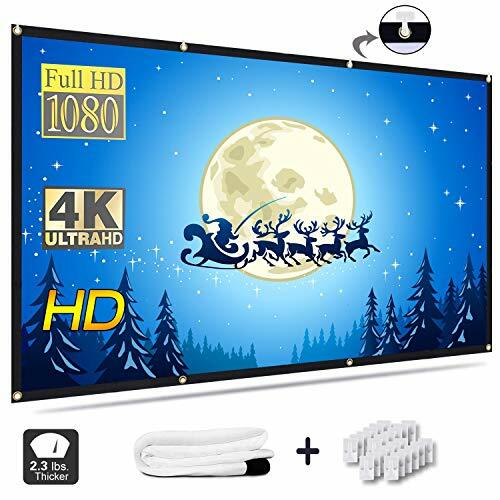 【WIDE APPLICATION】This projector screen support double sided projection, which is ideal choice for home theater movie; gaming; education; outdoor movie; football and more. So take it with your friends or kids that can bring you more happiness. 【SATISFICATION GUARANTEE】Buy with confidence. We offer 100% customer satisfaction or money back guarantee, please feel free to contact us at any time if you have any questions. ✌ Never Miss OUR P-JING HIGH Quality Projector Screen➤It will be your projector's best friend, start a new way of entertainment. 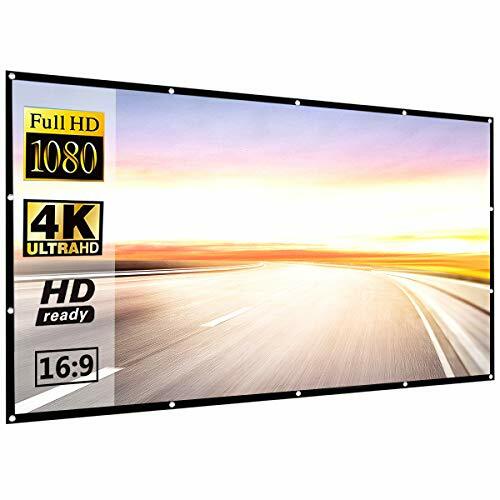 120 inch HD 16:9 EXCELLENT Movie Screen made from natural polyester fabric. You will never believe that such a little package will turn into a 120 inch projection screen! 2.2 lbs only, lights weight and portable, you can fold it in small size and take it wherever you want! 【THICK THAN OTHERS】Different from other ordinary movie screen, this is upgraded version,more than 2 times thicker than other low-quality projection screen to avoid light penetration for a clear image Screen. 【DURABLE& ANTI CREASES】Made of high quality polyester material and can effectively prevent wrinkle, no crease left When the screen is compressed or folded. 【FRONT & REAR PROJECTION】This simple projector screen is designed with suitable thickness for double-side projection, means that the image can be projected on either side of the screen. 【PORTABLE FOR TRAVELING 】Compact one-piece,lightweight and folding design. This simple projection screen can be folded to fit in a suitcase or backpack without damaging. 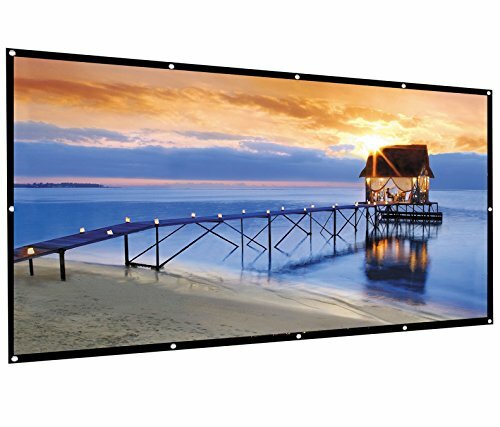 【PERFECT EXPERIENCE】100 inch 16:9 Folding Projection Screen High Brightness. 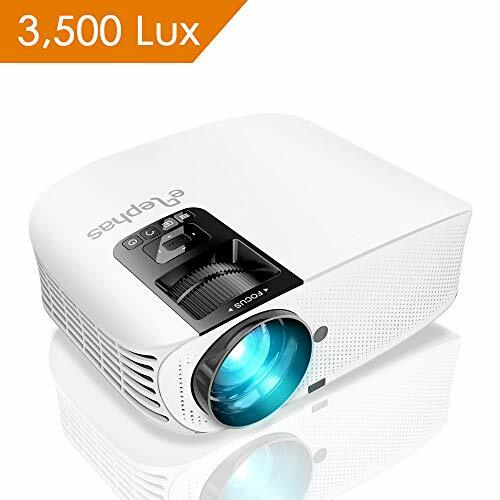 Made with natural Polyester fabric,Lightweight and compact one-piece design.It with the extremely low reflectivity and high average values of the projection display, providing flicker-free Viewing effect. 【DURABLE&PORTABLE】High Quality White Surface.Put it slowly on the floor and open carefully to avoid winkle appeared. Has a mildew resistant & waterproof coating. Non-deformation surface, synthetic fiber, and easy to clean with soap and water.To facilitate transportation, in terms of packaging, we use the way of folding,if you find the creases and wrinkled, use an Iron can solve it. 【EASY TO INSTALL】Easy to hang on the wall or use it on outdoor Can be rolled up,there have some metal holes can be installed.The Projection Screen can be fastened easily with hooks, ropes, bracket, nails, double side tape on the wall/mount.Easy installation and disassembling make it more comfortable. 【DIMENSION】16:9 screen format and diagonal 100" offer 87" x 49" viewing area. Packaged in rolls professionally. Please take into account that projection material sizes may vary by +/- 0.5" in length/width. 【WARRANTY】1-Year Manufactures Warranty and friendly customer service.If any product damage, avoid hassle return, you can contact with us anytime. Our customer service will respond to your questions within 24 hours to ensure a satisfying purchase experience. 【Upgrade Hole Version】: Hanging holes offer easy and quick installation, and the copper grommets are upgraded, more stronger than traditional grommets. Comes with free carry bag, more convenient to carry or store it. 【Material】: Made of high quality synthetic fiber, much thicker than other projector screen, it will project sharper image. And it is easy to clean with soap and water. 【About Creases】: Due to its foldable design, there is more or less creases when you receive the projector screen, but it won't affect its awesome using effect. And here are some tips to make it smooth: the most effective way is to use iron (not too hot); also hand washing is useful to make it flat; or you just need to hang it up, and the creases will disappear few days later.